OUR PRICE: $16.25 - Join Rewards Get $1 Dance Dollars On This Item! The Professional Mesh Transition Tight is a convertible tight designed specifically for classical dance and is constructed in a soft pointelle knit that provides a smooth sag-free fit. Features include a semi-opaque texture, transition foot opening, back seam, a 1" plush elastic waistband and dyed-to-match gusset. My daughter has alway complained about her tights. These are the first pair of tights that my daughter puts on with no complains. I recommand an of Mesh tights. These tights are recommended by my daughter's dance teacher. I normally wouldn't spend this much on tights, as my daughter is pretty hard on them...rips them often, but these have proved to be worth the money. Very durable. No holes or runs so far. She says the are soft and comfy, too. 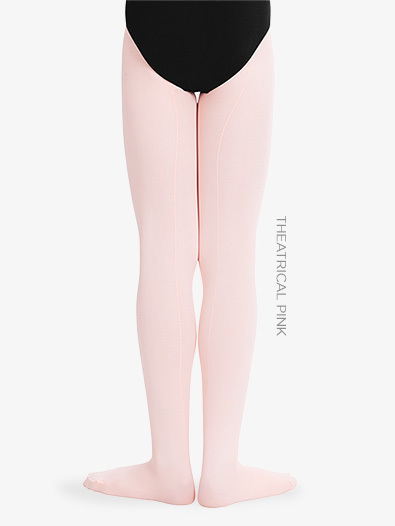 Great tights but go for Theatrical Pink! Great tights, comfortable, easy to pull on. The "Classical Pink" is really ugly! More like fake tan orange than pink. Very icky. Go for the theatrical pink if you are looking for the classic ballet pink. These seem to work the best over all for seamed mesh tights for my 9 year old. They don't sag in the knees like other brands, don't tear easily and fit well. These are good tights. The only thing I would warn you about is that they are REALLY pink! The pink goes away after repeated washing, but it is a shocker! They are still good tights and are thick so they don't run as easily. These wear like iron! Just get softer with each wash. The only tights that don't slide down the inseam! They r great 4 beginning Dancers! How do you make them get less pink??? I wanted to get C- 45 tights , but they weren't in stock and discount dance recommened capezio mesh tights. But the last time I got the tights the Classical Pink was too pink and theatrical pink was like white. What should I do?? We do have some sizes in the C45 Theatrical Pink in stock, or you can look at the 19C also. Hi... there are no sizes listed for the capezio seamed mock mesh convertible tights. please help.